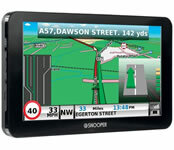 Select from the Snooper sat nav products below to find the best satnav for your needs. 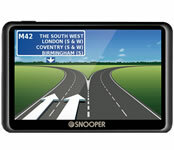 You can optionally add a speed camera locations database to the Snooper sat nav range. This database is called the Aura database and works via GPS. It will warn you of fixed and mobile speed cameras along you route. Preloaded to the device you receive My Speed database of speed limits. This will inform you of all roads speed limiits regardless of whether there is a speed camera present or not. If you are looking for a dedicated speed camera detector then please click here to visit our speed camera detector shop. Below you'll find the latest Snooper sat navs. All our sat navs are in stock (unless otherwise indicated) with same day dispatch when ordering before 1pm on any working day. Once you've found the sat nav you'd like to purchase you can either buy online using a debit/credit card or via PayPal. We use SagePay to process our online payments who are PCI DSS Level 1 compliant, so you have total peace of mind with your personal and payment details. Help? Not sure which sat nav to buy? See our sat nav buyers guide first.